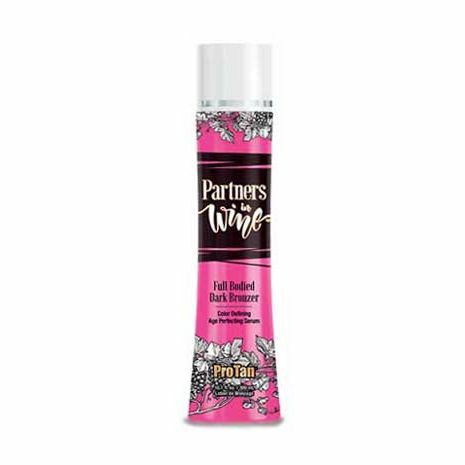 Pro Tan PARTNERS IN WINE Dark Bronzer - 9.0 oz. We’re always together, we’re one of a kind, three words describe us, Partners in Wine. This Full Bodied Dark Bronzer enhances your tan by delivering the perfect balance of bold, rich color. Resveratrol, a ground-breaking ingredient that not only promotes healthier, younger looking skin but also helps fade fine lines and wrinkles. Now, add in Grape Stem Cells, hints of Vitamins, Aloe Vera and hydrating extracts and we have come up with a winning combination for age perfecting skin. We could all us a Partner in Wine.